ANSI standards require manufacturers to record certain information and to permanently print it inside each hard hat. This information, printed in each hard hat, shows the year and month the hat was manufactured. The information can be found inside of the hat’s shell near the peak for easy reading. 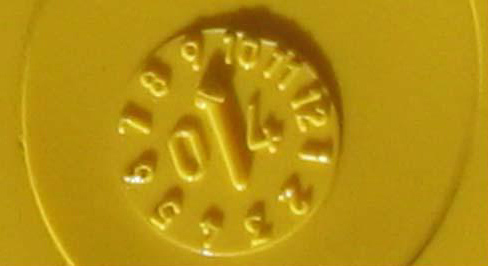 This image displays the month and year the hard hat was manufactured. The arrow points to the month, and the year overlays the arrow. In this case, the arrow points to 9 and the number is 04 overlays the arrow. This shows the hard hat was manufactured in September 2004. As a general guideline, your hard hat should be replaced every five years, regardless of the cap’s outward appearance. While most manufacturers’ guidelines suggest the hard hat be replaced if more than four to five years from date of manufacture, the actual “useful life” of the hard hat does not begin until the helmet is placed in service. If you work in the sun long hours or in extremely hostile environments with chemicals or high temperature, you may need to replace your hat after two years of use. Most manufacturers recommend replacement of the suspension inside the hat every 12 months. Proper maintenance of your hat ensures a longer life. Clean it with soapy water only. Other types of cleaning products may contain ingredients that could have an unfavorable reaction with your helmet, compromising its integrity. If a cap has been struck by a forcible blow of any magnitude, both the hard hat shell and suspension should be replaced immediately, even if no damage is visible.